^ Pike, Julie (September 7, 2010). "Tonight Show Ratings Plummet – Jay Leno Sinks Beneath Conan O'Brien Numbers". The National Ledger. Archived from the original on 2013-12-06. Retrieved October 4, 2010. 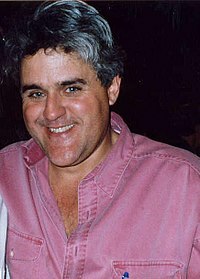 ^ "Jay Leno's Tribute to Johnny Carson". Google. Archived from the original on 2011-06-29. ^ "NBC soars as others stumble". MediaLifeMagazine.com. May 2002. Archived from the original on 2013-06-29. Retrieved February 7, 2014.